Hymn #41 -- "Let Zion in Her Beauty Rise"
This is a favorite hymn of mine. I love the match of powerful music with the bold, powerful text. The text is a prayer, but a mighty prayer offer with a raging fire. What I love most is how a bunch of black notes on a piece of white paper physically depict the most important attribute of Zion. More about that in a minute. Karen Davidson describes why Edward Partridge's text is so powerful. 4 of the original verses are missing in our 1985 hymnal, which is a real shame, especially considering the first-hand experience Patridge had. These are powerful verses. Here they are in their original placement. In Christ, their sure reward. The music makes a statement right at the start and then capitalizes of the initial energy of the opening bars with a fantastic rise to the top of the register by the end of the line. We get the muscular "Sol-Do" start followed by 2 quick eighth notes which the composer uses as a memorable motive throughout the hymn. "Her light begins to shine" begins with the 2 eighth notes, but this time they are ascending. They hit Do on the B-flat, then strike the C twice before rising all the way to the high D. What an excellent way to start the piece with a bang! Line 2 is mostly a repetition of line 1 but with a slightly different ending. All of line 2 will be repeated exactly in line 4. Both of these lines carry the same tune until right at the end as line 1. And both lines 2 and 4 use the 2 eighth-note figure in the also to add another layer of cohesion to the piece. This is a great tip for hymn writers: take advantage of a rhythmic motive found in the melody and use it in the lower voices (A,T,B). My favorite part is line 3. The first half of the phrase is repeated exactly in the 2nd half of the phrase and it's connected by another use of the 2 eighth-note rhythmic motive. Each of these repeated halves stays high in the tessitura (the consistent vocal register) and circles around the high D. Repeating that kind of high tessitura phrase, already giving off the feeling of yearning because of the high register, is multiplied in its power through the repetition. We really mean what we're saying here and the tune gives us the opportunity to make it unmistakable. Notice, there isn't a single accidental in the whole piece. Every chord, every note of melody and harmony belongs to the key signature. What a cool depiction of Zion, a people of "one heart and one mind, [and one key signature], and dwelt in [diatonic harmony] righteousness." 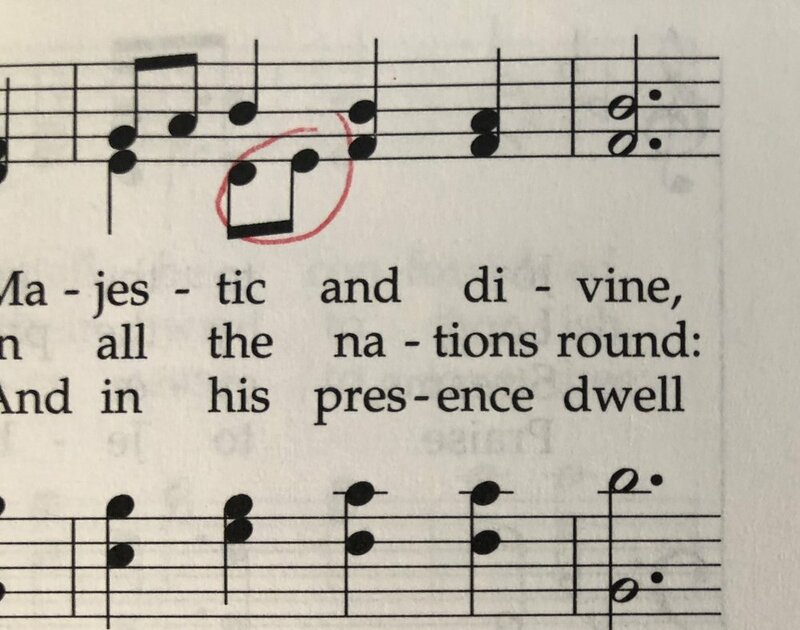 If we were pulling in all kinds of notes from other keys to color this hymn, it wouldn't be quite as "Zion-y," would it? It's fantastic musical idea painting and a good lesson to struggling composers. You don't have to write a bunch of chromatic stuff to create a fantastic hymn. That's all for today. Have a lovely Sunday! P.S. To download my complete harmonic analysis of Hymn #41, click the button below. P.P.S. Are you ready to show me your hymn or primary song? I'd love to help you out and offer helpful suggestions. Click below to apply for a hymn critique. A fabulous hymn with a tune that is well-known in Christian churches. Like the previous hymn, this hymn as more verses than what are provided in our hymnal. I renew my objection to this practice, as I think it too often weakens the effectiveness of the hymn’s message. If “some of the greatest sermons are preached by the singing of hymns,” then why do we remove part of the text? Why do we so easily and readily shorten the hymns to one or two verses, often truncating and obfuscating the message. I feel that we don’t understand the role of music in the church or have any sense whatsoever of its power and impact. We are taught that “the hymns invite the Spirit of the Lord, create a feeling of reverence, unify us as members, and provide a way for us to offer praises to the Lord...Hymns move us to repentance and good works, build testimony and faith, comfort the weary, console the mourning, and inspire us to endure to the end.” If that counsel is provided for us from the First Presidency in the front of our hymnal, why do we so readily disregard that teaching and count it as a thing of naught? The tune lends itself well to a bit of added harmonization at the unison spots and a pedal point in the third line. I often will play a B-flat major chord on the second note of the first line, going to a D minor chord on beat three, and then continuing on with the hymn harmonization. On the second line, I step the pedal down from the B-flat to an A on the first note, with either a D minor chord in second inversion or an F dominant seventh chord in first inversion as the harmony, and then a G minor chord on the second note (the B-flat on beat one of the new measure), and then a D minor chord on beat three. On the third line, you could use pedal points, beginning by playing a low F in the pedal for the first measure and a half, moving to an F-sharp on beat four of the middle measure (A of a people to prepare), moving to a G minor chord on beat one (peo- of people), moving to the written E-flat chord on beat four (pre- of prepare). Then on the last line you could use the same chords in the unison spot as in the first line. I feel that filling in those chords provides a nice contrast if you have played the first two verses with the unison beginning. That is a simple trick to add a bit of something to the hymn. Again, this hymn I feel is more successful if you feel it in two rather than four. A great tempo is half note equal to 64 beats per minute (quarter equal to 128). That provides for a nice bold tempo. A strong registration, perhaps finding a good softer chorus reed to us for the ensemble is recommend. This hymn yearns for principal chorus through mixture, with the inclusion this time of the higher mixture. E flat is such a dull key to my ears that the height is needed to give it more brightness.